I put some rounds down range today with the Echo1 Platinum M4. I know, I know. I thought it was very Coppola, too. I'm glad you and I agree. Here's a recap of the chrono data before I ran out of room on the camera's tiny HD. You'll notice that I've included two columns of the same chrono data below, the only difference being that I removed the first shot from my summary calculations for average FPS and such. Not sure what that 252 FPS reading was all about, but if you exclude that from the calculations like I did in the second column, the numbers look substantially better. Even taking the "252 FPS" into consideration, the overall results are pretty consistent. Granted, they could certainly be better, but I'm guessing with a little Teflon tape in a few choice spots, you could reduce the standard deviation even further. I will say that I've had this gun for a couple weeks now and when I chrono'd it right out of the box, it was shooting at 420 consistently. It would appear the spring has had a chance to settle down to a more field compliant velocity range, as most fields limit AEGs to 400 fps. I was using TSD .28g BBs for the groupings test. The target's dimensions a standard letter-sized, 8.5" x 11" sheet. This thing is a beast. It weighs quite a bit. Between 30lbs and 40lbs, I would guess, and is rated to handle .22 cal non-magnum rimfire rounds. 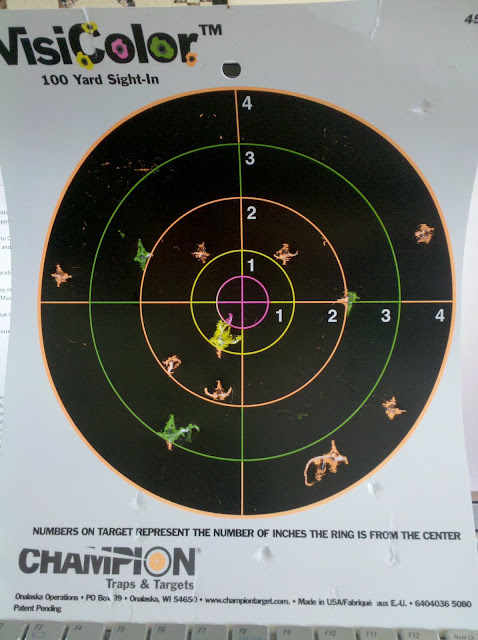 I was firing from a kneeling position and did not use a bench rest of any kind. This is the resulting target groupings. I really like the color splats that show up when you hit inside the circle. Very cool and really helps to show up in the picture. Sooooo...what does this tell us? Well, for starters, the Echo1 Platinum M4 is certainly a viable option for outdoor skirmishing with groupings like that. You'll definitely be "lighting fools up" all day long with some decent BBs and properly adjusted hop-up. It didn't take much for me to sight the rifle in to a decent degree. I would also like to point out that I did test out some of my Classic Army magazines in this gun to see if they would compatible and had no issues. No misfeeds or anything. So that's always nice to see the cross-platform compatibility. I know that the gun comes with a Hi-Cap AND a Mid-Cap mag, but I don't like to feel limited in my options or ammo supply. Just in case. - Comes with a decent, lockable hard case for safe transport & storage. - Tons of aftermarket accessories will fit this gun, like optics, rails, grips, stocks, etc. - The Version 2 gearbox is highly upgradeable and there are seemingly endless amounts of replacement & upgrade parts available in the event something fails internally. - Wired for Tamiya Connectors. Have I ever told you how much I hate Tamiya Connectors? - Crane stock slightly smaller than what I would consider to be standard size, which make battery options an issue for those that have neither a small enough battery or a replacement stock of larger size.